A distraught young woman reaches out to her ex-boyfriend for help in tracing her kidnapped daughter, but her husband, and everyone that knows them, insists the couple had no child at all. So is she imagining things, or is there more to it? That intriguing premise, of Baaghi 2, is buried under an avalanche of mediocrity – needless romantic backstory, too many songs, corny humor, an entirely pointless item number, cringey performances, frequent lapses of logic, and a disappointing reveal. I’m going with two out of five for Baaghi 2. It’s got its moments, but that’s all there is. Also, a request to directors, please don’t use the very complex conflict in Kashmir as a prop to establish heroism – the casual reference here to human shields is offensive. Still, all things considered, Baaghi 2 is an improvement on the generic Tiger action movie. At least the action is grounded in some emotion. The biggest plus point of the story is that it has a number of turns and twists. However, despite the twists and turns, it appears implausible at times because of its structure.On the whole, Baaghi 2 has abun­dant action but lacks in other ingredients of an entertainer. It has taken a flying start (because of great action, fantastic promotion and the Good Friday holiday) and will, therefore, keep its distributors safe. The producer, of course, has made a huge profit under-production. The trouble with a full-on masala film going in search of a plot is evident in the way the film unspools. The bare bones are borrowed from Telugu thriller Kshanam, but the fillings are all strictly Bollywood: the attempt to create difference gets diluted. After a while, inevitably, all the bang-bang starts feeling familiar, whether it is happening on the streets of Goa, where much of the film is set, or in some jungles, location unspecified, where the long-drawn climax takes place. Baaghi 2 is an all-out action film with suspense and thriller elements. The first half is all about the setup.The second half though is a completely different tale. The slow pace of suspense and the romantic track give way to twists, turns and an action-packed finale. Ronny goes from the slightly confused soldier to an absolute blood-thirsty nutter with nothing but revenge on his mind. It gives Tiger Shroff the chance to exhibit his martial arts skills in full glory. Tiger Shroff is synonymous with sleek dance moves and kickass action. His fans will be in for a treat to watch a number of his shirtless moments on the 70 mm screens where he is flexing his muscles and breaking bones like a professional. This is ‘Baaghi 2’ which is loaded with action and drama but it is the badly written script and lousy direction by Ahmed Khan which makes it a drab affair. BAAGHI 2 is adapted from a Telugu film KSHANAM by Sajid Nadiadwala and the plot is very weak. Although one is not supposed to look for logic in masala films, the level of absurdity in this flick is too high. On the whole, BAAGHI 2 boasts of an extraordinary action and spectacular performance from Tiger Shroff with an absence of a convincing and engaging screenplay as a minus point. At the box office, it will score huge over the weekend in the mass dominated circuits. However the real test for the movie will begin from Monday onwards. In Baaghi 2, rebellion – trigger happy, brooding endlessly and snarling at everything in sight – comes in a single standard size, the one that the beefy Tiger Shroff embodies in all its skin-deep splendour. He is a glistening, muscle-bound, mayhem-unleashing mannequin that, at the slightest provocation, strikes out with telling force. Get out of his path if you care for your life and limbs! The action thriller that draws power from the virile exploits of this protagonist is replete with eye-popping, heart-pounding, brain-numbing and inordinately drawn-out stunts and fights. Director Ahmed Khan is almost three to four films old now. And this is visible in Baaghi 2. The finesse, flow, and flawlessness in the movie are proof of good direction. Baaghi 2 is the best movie to date that Ahmed Khan has directed. Just minus the 30-odd minutes of action where Tiger lands in a jungle from nowhere to fight Manoj Bajpayee. 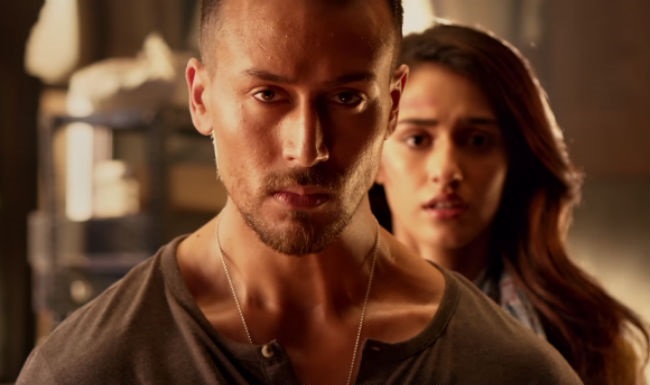 It seems the director was under some pressure to fit in the 30 minutes of action thrills to match up to the Baaghi action, else this movie could have gone to become Ghayal 2 and joined the 100-crore club. Baaghi 2 makes for a good film to watch with the family. Also, people who are die-hard action fans or are in love with Tiger-Disha, definitely can’t miss this film! Baaghi 2 desperately hopes that slow-mo shots of the hero’s abs and his stunts, set against blaring background scores, can uplift a dull narrative. Unfortunately, the audience today is far more discerning than that. Producer Sajid Nadiadwala doesn’t waste any time in finding a writer, and instead invests in a Telugu film Kshanam and slightly tweaks its storyline to make it his own. Even the dialogues are written in rhymes, and amplified to win applause, but what it does instead, is annoy. He hands Ahmed Khan the power to design this thriller, conveniently forgetting that his strength lies in choreography. A battle-hardened army officer squares off against drug lords and Russian henchmen to save his ex-lover’s kidnapped daughter in the underbelly of Goa, India.